Deep into the Vale of Promise ventures a young knight, Sir Constant, who desires nothing more than to be in service of the Great King. Though unworthy of this high calling, he sets forth on the perilous road that all who desire to serve the King must take - the Splendid Way. His heart, courage, valour, and faith will be tested. His strength and endurance will be challenged. And his allegiance to the one true King will be proven. A richly dramatized allegory wrought with biblical truth. From Anonymous of Mokena, Illinois on 10/29/2018 . Our family with youth ages 11-19 listened to this audio and each one of us was captivated. My youth likened it to “The Pilgrim’s Progress”. Would totally recommend it as a must for your library. It encouraged my young people that even though we fail we need to stay the course and not give up or be discouraged. From Anonymous of Neosho, Missouri on 9/17/2018 . My grandchildren and I listen to the CD on our way to church. They ask questions aboout what is happening in the story. I am glad that they are asking questions. From Charles Parton of Hamilton, Ohio on 1/15/2018 . I have listened to this a few times with my wife and two children ages 11 and 5. The story has many points that illustrate biblical principles and salvation through Jesus Christ. From Laura Murray of Killeen, Texas on 12/19/2017 . You Won't Regret This Buy! From Anna Mockler of Marco Island, Florida on 12/15/2017 . From John Craymer of Hatboro, Pennsylvania on 10/9/2017 . were spell bound and the teachers were truly engaged that 2 requested information about the book and 1 received this CD copy as a gift from me. From Trisha of Amboy, Washington on 2/5/2017 . This was so realistic, I closed my eyes and imagined many of the scenes ! A little too much for my young ones. All the older children enjoyed it ,and my 15 year old son gave it a HUGE thumbs up with a big smile too ! From Anonymous of Albany, Georgia on 2/8/2016 . Simply outstanding. This is perhaps my absolute favorite radio drama. Riveting from the opening to very end and the revelation of the King. The characters are engaging and the plot captivating. From Schylie of Centerville, Massachusetts on 1/14/2016 . This audio drama is captivating and powerful. It digs deep into what it means to be a Christian and what we encounter during our walk with God. It shows the need for repentance and the lack of righteousness we have in ourselves. This audio also shows us that when we show love and kindness to others, we are showing this love to Christ--"as you did it unto the least of these, you did it to me." From Amy Steeger of The Colony, Texas on 10/6/2015 . WOW!!! This was just like an 18th century Pilgrim's Progress with a Knight instead of Pilgrim. Everyone, young and old, needs to read or listen to this story. It was very encouraging in my walk with Christ! I will be passing this on to everyone at my church!!!! This audio drama was very well done as always!!! From Anonymous of Blackshear, Georgia on 9/29/2015 . From Daniel Buckingham of Palmer, Alaska on 1/12/2015 . This dramatization is excellent... I have learned many valuable truths through it and it has inspired me to keep up the good fight of faith. Thank you! From Anonymous of Chehalis, Washington on 1/8/2015 . The foremost reason I enjoy and strongly support Lamplighter Theater is due to how they embrace and promote Christian principles in their audio dramas. From Susan of Greenville, South Carolina on 9/4/2014 . The whole family enjoyed it! My children said it was like a movie in their minds. From Anonymous of Endicott, New York on 8/3/2014 . I have listened to most of the Lamplighter Theater audio dramas on a local Christian radio station, and I can honestly say that this is my favorite. It is not only enjoyable on the surface as an adventure story, but also contains rich allegorical truth about the things of God and His Kingdom. It is also a story that is will draw the listener to listen to again, based on what is revealed toward the end of the story. We recently purchased several copies to have available as "prizes" during a Vacation Bible School at our church. From Sheri Mowery of Knoxville, Tennessee on 7/29/2014 . I liked this CD but there were a few problems with it. First it was so hard to follow. I didn't know where the knight was or what he was doing. Second, I couldn't enjoy it because I could easily predict who the Black Knight was and who his subjects were. Last, some of the scenes could have been portrayed better. I thought the story was alright but it wasn't my favorite. From Leslie of Lima, New York on 7/5/2014 . All the Lamplighter audio books I've received have been extremely well produced. I am so impressed with the quality of the British acting and the sound. I fondly recall mother reading to us when little and then taking us to the library when older and I still love being read to! Many thanks to all the folks that bring these important lessons to us in this form. God bless. From Rachel Dowling of Tinton Falls, New Jersey on 6/16/2014 . I have 2 boys (one teen and one preteen) and they didn't want to stop listening to this excellent dramatic audio! From Lynn of Rockmart, Georgia on 10/9/2013 . 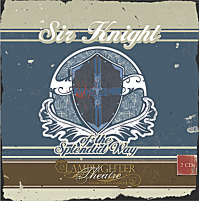 I have listened to Sir Knight of the Splendid Way numerous times. Each time I am so touched (or maybe convicted) as I follow Sir Constant along the splendid way. We, like Constant face the perils of the way in our own journey. This CD brings to light those things in a manner reminiscent of Pilgrims Progress. It is a thought provoking, exciting, and exceedingly well done production. I would totally recommend! From Anonymous of Dover Plains, New York on 3/23/2013 . We got this CD when we went on vacation.It`s a little like Pilgrim`s Progress,but still its own story.If you listen to it,try to catch the symbolism.We LOVED it,and highly recommend it!!!! From Becky Johnson of Colorado Springs, Colorado on 3/8/2013 . An allegory similar to that of Pilgrim's Progress, with many reminders that Satan is a master of deceit for whom we must constantly be on guard. Never take off your armor, good Knight, and let your sword be ever ready for battle!